When will the next bear market begin? That's the question everyone's asking. And today, I'll answer it. No, I can't tell you the exact day the market will peak. I can't tell you exactly when to pull your money out of stocks. But I will give you the latest update on my "bear market predictor." Right now, this indicator is dangerously close to issuing a major warning for the market. Today, I'll tell you what that means for my "Melt Up" thesis, and how we plan to invest from here. You need to watch one simple number if you want to know when this bull market will end. You don't need to focus on economic data... or the news headlines... or what's coming out of the White House. This number is what really matters. 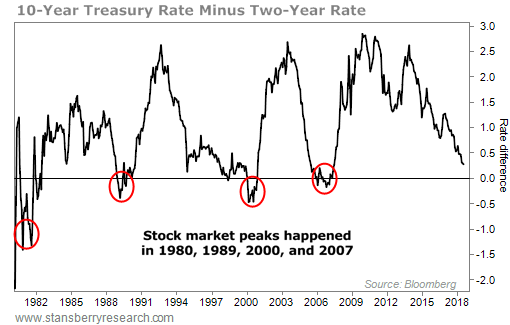 If you want to know when this bull market will end, all you need to watch are interest rates. Specifically, the "spread" between long-term and short-term interest rates. I say this because this spread has correctly identified every major stock market peak of the past 40 years. When the spread falls below zero, look out. Tough times are ahead. This is an indicator that longtime DailyWealth readers know well. It looks at the difference between the interest rates on 10-year and two-year government bonds... The spread is the yield on 10-year bonds minus the yield on two-year bonds. This spread tells us a lot. That's because the market controls longer-term interest rates... but the Federal Reserve controls short-term interest rates. When the Fed raises short-term rates, it's trying to slow the economy down. A negative spread has been a major warning sign for stocks and the economy in recent decades. In fact, a negative spread has happened before every major bull market peak going back 40 years. A fall below 0% has been a major warning sign for a coming bear market. And if you look at the far right of the chart, you'll see that spread has crashed in recent months. We're now darn close to going negative. That's a bad sign for the long term. It means the countdown to the bull market peak could be upon us soon. I don't want you to worry too much, though. You see, the spread tends to go negative with plenty of warning before the stock market peaks. So when will the bear market begin? Once the line hits zero, this indicator gives us between six and 18 months before the bust starts. In fact, the last three times the line has hit zero, it took 18 months for the stock market to peak. I believe the Melt Up is officially here. This is the boom I've been waiting for. And this phase should last 12 to 18 months. The biggest gains in a bull market tend to happen during the Melt Up phase. We want to be invested while it lasts. Along the way, the spread will go negative, warning us of the coming bust. I'll become more cautious when that happens... watching closely and selling at the first sign of trouble. We're not there yet. So while this "bear market predictor" is nearing a major signal, my advice remains the same. The Melt Up is here... Stay long stocks. "Right now, my computers are getting more bullish on U.S. stocks," Steve writes. Yet investors are still scared to get on board. Learn more about why the numbers say now is a great time to buy, right here: Stop Worrying... You Want to Own Stocks Now. We’re talking about Planet Fitness (PLNT). 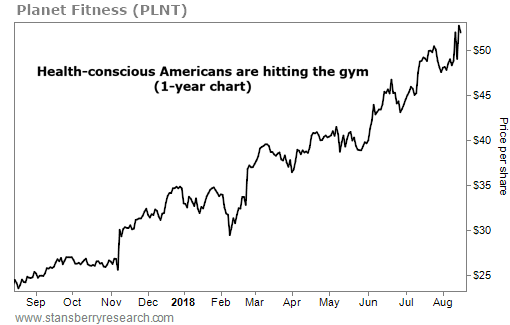 With affordable memberships and more than 1,500 locations across the country, Planet Fitness makes it easier for the average American to get in a good workout. This year, the company opened 44 new gyms in the second quarter alone… growing memberships by 16% to more than 12 million members. In the same quarter, sales jumped to more than $140 million, up 31% year over year.